Get your iPhone to ignore low-quality wireless networks by making use of the Auto Join WiFi option. One of the features that was added during the iOS 11 beta test some months back was a new option for iPhone and iPad owners to auto-join wireless networks of their choice. Mobile users are often out and about, surprise surprise, so the option to auto-connect to familiar networks can be really helpful. However, depending on certain networks and carriers, the iPhone may at times try to connect to wireless networks with dodgy connections or slow download rates. Android phones have had options to disable specific networks for a few years now, but those running Apple devices will want to know how to edit or disable the iPhone auto-join WiFi network option. 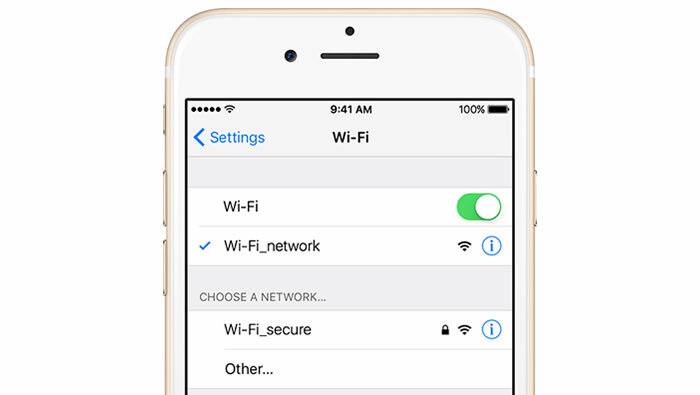 The process for enabling or disabling the iPhone auto join WiFi option is extremely simple. In the WiFi settings menu, which can be found by going to Settings and then Wi-Fi, users will be able to see a list of available wireless networks. From there, they can slide the Wi-Fi toggle to disable wireless functions entirely, or tap on a network and toggle Auto-Join to enable or disable the function. Primarily, this tool is meant for users who want to weed weak networks out of their list of saved networks, even if they don't want to delete their saved network credentials. iPhone users running the latest build of iOS 11 also have access to a helpful feature that should stop the phone from connecting to weak WiFi networks. This isn't something that users can enable or disable on their own; instead, the iPhone will itself automatically disable Auto-Join for low-quality networks. Though this should prove beneficial for most people, it does mean that users will have to manually connect to weak WiFi hotspots, particularly those who have disabled the Ask to Join Networks option.